George Walsh’s chief claim to fame is the movie he didn’t make. He’s one of three actors known to have been the 5 of Spades in the Moriarty deck, and probably not the first. Of the other two, the first was probably Harold A. Lockwood. I say “probably” because Lockwood didn’t have long to join the deck, so he must have done it early; he died in the Spanish Flu pandemic of 1918, age 31. Before that he had appeared in 131 pictures since 1911, with three more released posthumously. 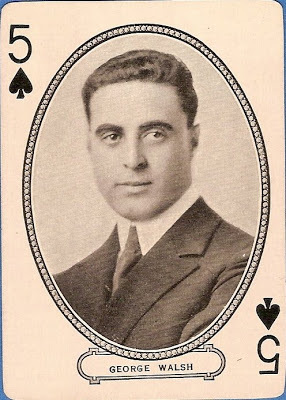 In 23 of those pictures, all between 1915 and ’17, he was half of a romantic team with May Allison (5 of Diamonds in my deck, Queen of Hearts in others). The other 5 of Spades was Charles Kent, already 64 years old by the time the cards were introduced in 1916. 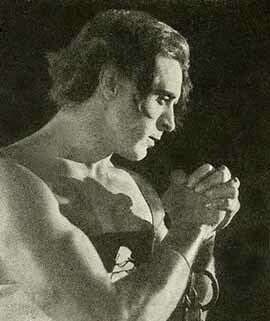 Kent’s first known picture was in 1908 — Macbeth for Vitagraph (and he played old King Duncan in that). Unlike Lockwood, he would outlive the production of the cards, dying in 1923 at 70. My guess is that Lockwood was the first face on the 5 of Spades, Kent the second, followed by George Walsh, who didn’t make his first picture until the others had made 94 and 81, respectively. This is as good a time as any to talk about those numbers of pictures I keep throwing around. Ninety-four and 81 pictures in less than ten years? Why, Dustin Hoffman and Jack Nicholson (to take two random, veteran examples) haven’t made 80 pictures apiece in their entire careers. Of course, we’re not talking about full 90-to-100-minute features here, although such things weren’t unheard of even as early as 1915. By the late ‘teens, the average feature was about five reels — between an hour and 75 minutes, depending on the speed of individual hand-cranked projectors used in those days. Before 1915 or so, most pictures were probably two or three reels — the rough equivalent of an episode of a TV series. That’s how Harold Lockwood and May Allison could make 23 pictures together in two years, but it’s still a pretty breakneck pace. Mutual, Vitagraph, Biograph, Edison and Famous Players-Lasky kept their actors and crews busy, grinding out material for the burgeoning number of movie houses, where a picture would seldom play more than three or four days. But back to George Walsh. Born in 1889, he followed his older brother Raoul into pictures in the mid-1910s, having originally planned to be an attorney (he attended, however briefly, Fordham and Georgetown). He also attended New York’s High School of Commerce, where he graduated in 1911, and where he was a versatile athlete: baseball, track, cross country, swimming, rowing. This experience would stand him in good stead, at least in the Hollywood short run — certainly better than whatever he learned about commerce or pre-law. I don’t know what drew George to pictures in the first place, but it’s easy to imagine him being lured by the stories his brother told. Raoul had backed into pictures after working as a cowboy; his horsemanship had landed him a stage job, riding a galloping horse on a treadmill for a touring company of The Clansman. From that he got the acting bug, forgetting all about cowpunching. He wound up in New York making westerns (mostly) for Pathe, then followed D.W. Griffith to California. He loved the freewheeling fun of making pictures in those days, and he surely must have painted an enticing picture for George — “With your looks and athletic ability, you’re a natural for this stuff.” Hal Erickson at AllMovie.com says that George joined Raoul at Reliance-Mutual in 1914, but according to the IMDB, George’s first picture was an indeterminate bit in The Birth of a Nation for D.W. Griffith. Or more likely a series of bits; Griffith was economical in his use of extras, and George may well have been one of those who saw himself on screen fighting on both sides of a battle. Raoul played John Wilkes Booth in Birth, but was already on his way to a director’s career (it would extend to 1964; Raoul Walsh remains a favorite director among critics and historians). George did get his first breaks in Reliance-Mutual pictures directed by Raoul and others, moving up the cast list till he was top-billed, and first drawing the eye of Variety’s reviewer in Raoul’s Blue Blood and Red (1916): “The kid is clever…a fine, manly looking chap, full of athletic stunts…” By this time, both Raoul and George were working for William Fox, and soon George worked again for D.W. Griffith. Here he is as the Bridegroom of Cana in the Judean Story section of Intolerance, receiving the bad news that the wine supply has run out. With him are 17-year-old Bessie Love (still several years from her own stardom) as the Bride of Cana and William Brown as the father of the bride. 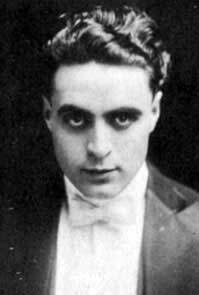 George Walsh’s career flourished as William Fox’s slightly younger answer to Douglas Fairbanks. By this I mean the early Fairbanks, before The Mark of Zorro, Robin Hood, The Thief of Bagdad, etc. landed him permanently in costume swashbucklers. Before Zorro, the typical Fairbanks hero was a boyish, high-spirited American naif, triumphing over adversity in effortless leaps and bounds, always with a beaming, irresistible smile. George’s career did get a little heavier as the 1920s dawned. In 1922 he played explorer Henry Morton Stanley in With Stanley in Africa; neither the film nor any reviews seem to have survived, but it appears a more serious departure from his vehicles to date. So was Vanity Fair the next year, in which he played the dashing wastrel Rawdon Crawley, though the picture was not well received. It’s an open question how well Thackeray’s huge novel could be adapted into an 80-minute silent movie, but writer-director Hugo Ballin seems not to have risen to the occasion; Variety carped that most of the picture was frittered away on closeups of Ballin’s wife Mabel, who played Becky Sharp. In any case, Walsh didn’t make much of an impression. He had better luck with Rosita, playing the love interest for Mary Pickford under the direction of German emigre Ernst Lubitsch making his first American picture; Walsh basked in the reflected glory showered on Lubitsch and Pickford by the movie’s artistic and commercial success. Then came what looked like the break of a lifetime: George Walsh was chosen by June Mathis to play the title role in Metro’s screen adaptation of Ben-Hur, to be shot on location in Rome. This was the role that every actor in movies coveted. The most popular choice, Rudolph Valentino, was out of play because of a contract dispute with Famous Players-Lasky; until they settled their differences, the studio wasn’t about to let him work for anyone else. Mathis ordered tests, dozens of them, and Walsh won out. In his recounting of the Ben-Hur production in The Parade’s Gone By, Kevin Brownlow tells us that there was little enthusiasm in Hollywood for the choice; George was a fine physical specimen, they said, but not that strong an actor. To Walsh, this was surely the gravy train to glory, and he grabbed on with both hands. He gladly agreed to a salary cut when offered the role, and even swallowed his umbrage when, as the company sailed for Italy in the spring of 1924, he found himself relegated to second-class accommodations. Arriving in Rome, he worked out every day with his co-star Francis X. Bushman (playing Messala) and posed for a few publicity stills like this one. Otherwise he was ignored. Things didn’t go well for Ben-Hur in Italy. Sets weren’t ready, equipment wasn’t available. Matters began in a state of disorganization and degenerated into hopeless chaos. June Mathis, ostensibly the production supervisor as well as scriptwriter, was barred from the set by director Charles Brabin — not that there was much set to bar her from. While construction dawdled along, the company adjourned to Anzio to shoot the sea battle; Brabin sat around drinking wine and regaling the crew with longwinded stories while underlings haggled with local bureaucrats, and hundreds of extras idled sweltering on the beach. When cameras finally rolled, everything went wrong. Well, I needn’t go on; you can get the whole story from Brownlow. By autumn of 1924, the newly-formed MGM had inherited this mess, and L.B. Mayer and Irving Thalberg took drastic measures. Brabin was fired because his footage was awful. June Mathis was fired because she had been the supposed supervisor of this fiasco, and had insisted on shooting in Rome in the first place. And George Walsh was fired because Mathis had hired him — besides, MGM wanted to build up their rising star Ramon Novarro. Walsh and Bushman (one of the few survivors of the purge) read about the changes in the newspapers. It was a bitter pill for George. “You know, Frank,” he told Bushman, “I felt this was going to happen. But to leave me over here for so long, to let me die in pictures — and then to change me!” Because MGM, in damage control mode, kept mum about the state of the production and the reasons for such sweeping changes, the impression was left that George simply couldn’t cut it — just as everyone expected. Could he have cut it? Maybe, maybe not. 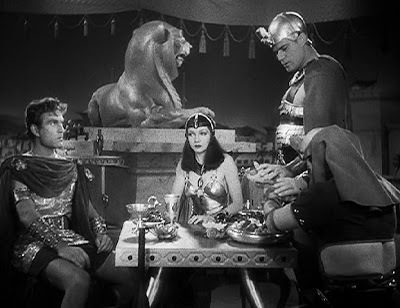 June Mathis shrugged off her own dismissal, saying her chief regret was for Walsh: “I had complete faith in his ability to play Ben-Hur,” she told Photoplay. “I realize many other people did not believe in him, but the same thing occurred when I selected Rudolph Valentino for the role of Julio in The Four Horsemen. Valentino justified himself, and I am confident that Mr. Walsh would have done the same thing. Actually, he was given no opportunity to succeed or fail. He was withdrawn without a chance. Indeed, Mr. Novarro was in Rome for three days before Mr. Walsh was notified that he had been succeeded in the leading role.” Nevertheless, in Hollywood — then as now — image was everything. George slunk home a “failure,” even though he had not faced the cameras for so much as a frame of film. After the coming of sound Walsh made a few movies, but was never again top-billed. Supporting roles (often in brother Raoul’s pictures like Me and My Gal, The Bowery and Under Pressure) slid into bits — like this one in Cecil B. DeMille’s Cleopatra (1934), as a courier bringing Antony (Henry Wilcoxon) and Cleopatra (Claudette Colbert) the bad news that Octavian is on the march. After Raoul’s Klondike Annie and a couple of Poverty Row westerns in 1936, George decided to call it a day in pictures, and retired from the screen to work as a racehorse trainer for the Hollywood horsey set. All in all, George Walsh didn’t have such a bad run; his pictures were breezy, undemanding fun in their day and he had a definite following. Getting canned from Ben-Hur was a blow, no doubt, but how much of his subsequent career slide was due to his two years out of circulation, and how much was simply because his day was done, is something I guess we’ll never know. Like any other star, he arrived, he blazed, and he waned, then (unlike some) lived to a ripe old age: George Walsh was 92 when he passed away in Pomona, Calif. in 1981. I must correct you on your statement in this article that George Walsh only married once. That is not true. I was married to his oldest Son, Thomas Walter Walsh and also knew his youngest son, George Walsh. I married Tom in 1982. I met his Dad one time. He was in a nursing home and suffering from dementia. Soon after, his Father passed away. We attended the funeral but not many showed up. We also attended his Uncle's funeral, Raoul Walsh. He passed before George did. We went to the funeral and Gregory Peck attended and was one of the pall bearers. So George Walsh, Sr. was married for many years to my ex-husband's mother. I never met her and cannot remember her name I am sorry to say. Tom and I divorced in 1990 and I have not seen him since. Welcome, Anon, and thanks for the correction! Unfortunately, at this late date I can't seem to pinpoint where I got the idea that George had married only once, but I appreciate your setting the record straight. Re: Anonymous, her name was Winifred Craven or Cravens? I miss those days G.W. with you guys on Valley, if I knew how to contact you I would. Thanks for stopping by and commenting, Art. FYI, all four of your attempts were successful, but the last three came through before I had a chance to approve the first.